Fujitsu today extends its notebook portfolio with two new additions which offers dual-touch, multi-finger gesture functionalities and are powered by 2nd Generation Intel processors. The nee Fujitsu LifeBook T731 and TH701 feature a sleek and glossy, metallic exteriors and are packed with bi-directional, 12.1-inch WXGA LED backlight displays which support both – multi gestures and digital stylus pen input. Both are equipped Fujitsu’s patented ventilation system with removable dust filter and enhanced cooling capabilities for prolonged operational life. 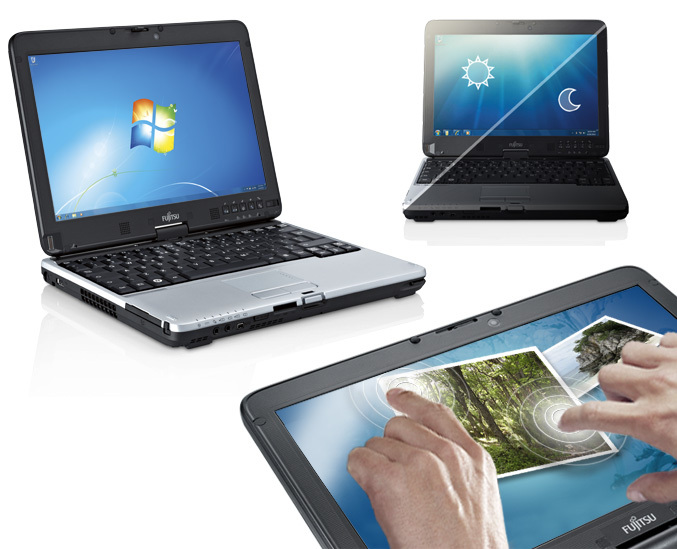 They come with the new Intel mobile Intel 6 Series Chipsets and up to Intel Core i7 vPro processors, along with support for Intel Wireless Display, to let you wirelessly connect the tablet PCs to a large screen HDTV. The new machines also include the Fujitsu 3D Shock Sensor, Fingerprint Sensor and Fujitsu LIFEBOOK Lock, while the professional oriented T731 model can be configured with optional Trusted Platform Module (TPM) for enhanced data protection. Along with standard connectivity options like Gigabit Ethernet, 802.11 abgn WiFi and Bluetooth, T731 and TH701 also offers embedded 3G/UMTS with GPS, a Spill-resistant Keyboard, USB 3.0 ports, HDMI, modular bay for an optional second hard disk drive, DVD drive, Blu-ray Disc combo drive or second battery. Fujitsu reckons that the T731 and TH701 should get around hours 50 minutes with a standard battery and up to 11 hours with an additional bay battery. Fujitsu didn’t say when the Tablet PCs would reach stores.